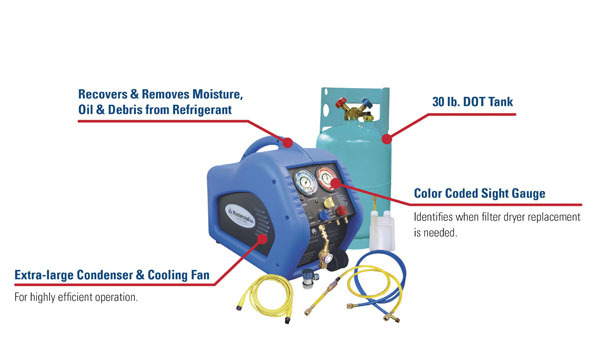 Mastercool’s 69100 Professional Recovery System is compact, lightweight and works with all refrigerants. Our Recovery System offers a State of the Art 1/2 hp Oil-less Compressor with a built-in High Volume Cooling Fan. This New innovative design delivers maximum cooling efficiency which keeps the compressor working at high capacities in even the warmest climates. The Compressor is protected by an Automatic Low Pressure Cut-off Switch that Shuts Off the Unit once the recovery is complete. This Auto Shut-off Feature eliminates the risk of compressor failure and reduces the user’s need to monitor the entire recovery process. The 69100 also includes an Oil Separator and Filter Dryer to cleanse the refrigerant during the recovery process. The Mastercool Recovery System offers our newest color-coded gauges with Pressure Readings in PSI, BAR and MPA. The Stainless Steel Ball Valve designed Manifold controls the refrigerant flow smoothly and quickly with only a 1/4 turn. All of the internal components have been arranged and isolated to ensure a smooth and quiet performance. With all of this protected by a reinforced hard plastic case, Mastercool’s New Recovery System will meet all of your refrigerant needs.